Home » Broadband » City of Harare upgrading to smart city status? City of Harare upgrading to smart city status? Here’s something intriguing spotted yesterday in Harare – Some construction work on some traffic lights in the CBD. It looks like there’s the installation of surveillance cameras opposite Town House. Is this phase one of transforming Harare into a smart city? While we haven’t been able to get any information from the City of Harare on whether this is the start of a rollout plan for a city wide surveillance/ICT project the sighting actually triggered a lot of questions that haven’t been answered because of long consultative processes. Beyond the obvious introduction of surveillance on its doorstep, is the City of Harare going to be exploring other aspects of infrastructural upgrades, perhaps with funds secured through “strategic partnerships with our all weather friends”? Or are they setting up infrastructure to monitor traffic especially the errant kombis ? Never mind ZOL’s efforts but can we expect to see the City of Harare pledging to give internet access to everyone before we host the World Cup, perhaps free WiFi spots (just think of a municipal powered SaiSai project)? Past engagement in public sector ICT development that comes to mind is the Econet Metro Fibre Network; the $3.5 million project involving Harare and Liquid Telecoms which led to the installation of fibre optic rings in the city. Maybe the city fathers have partnered with another private entity to make the streets safer. Currently any work on Public Sector ICT development is hinging on the Draft ICT Policy that explores how investment will be made in ICT to support national objectives. One area that has been touched on in this draft Policy is the work on infrastructure projects through Public Private Partnerships. This approach has seen relationships being formed with providers like Huawei in projects like NetOne’s broadband expansion. Huawei has already showcased its competence in Smart City projects, something that was also emphasised through presentations at the Public ICT Forum held in April this year. If by some stroke of luck and of course a special arrangement(monetary being the biggest issue here) some of that work is achieved we really could have smart cities. Unless they are setting up a live feed so WE can make sure they’re actually working instead of joyriding in OUR new SUV’s, its a waste of OUR hard earned money. You dont know what a smart city is. Thanks to the City fathers for the action taken to revamp roads, we have seen it along Samora Machael this week. 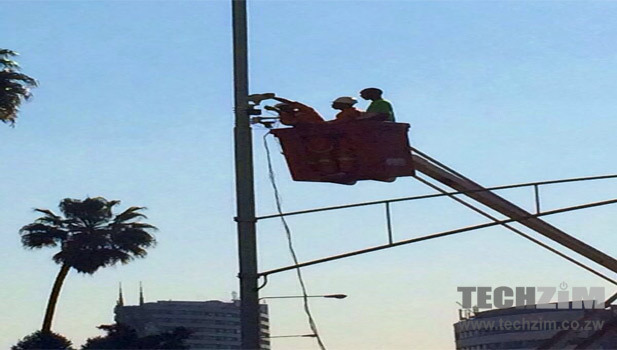 Before mounting surveillance cameras, they need to repair street lights/lamps because it’s futile to use the light only during broad daylight. Funny, World Cup 2034 Zimbabwe will never host it…. You will see it and not partake of it. Be careful what you say against a prophetic word. Hogwash… Where is miracle money now, when we are facing liquidity crunch? FYI the Samora Machel revamp nowhere near City of Harare efforts. Its part of the Forbes-Plumtree Highway spanning from Mutare to Bulawayo. My question… does anyone really know what the city fathers are up to? I noticed a second traffic light today.